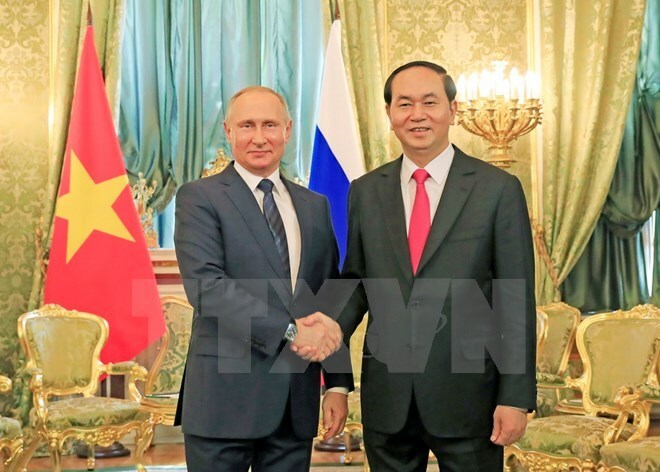 Moscow, (VNA) – President Tran Dai Quang and his Russian counterpart Vladimir Putin on June 29 (local time) expressed particular interest in strengthening commercial cooperation, agreeing on investing more than 10 billion USD in both country. At a joint press conference following talks between the two leaders in Moscow, the two leaders announced that the investment will be poured into 20 priority projects, including a joint Vietnamese-Russian oil and gas enterprise, the construction of a light industrial zone in Moscow and projects carried out by Vietnamese dairy group TH in some Russian localities. Another 500 million USD would be spent on projects with high potentials in new areas of bilateral cooperation like agriculture or medicinal herbs, the leaders said. The two countries have also set an ambitious target of raising bilateral trade to 10 billion USD by 2020. Oil and gas will remain the top priority sector for cooperation between the two countries, Putin said. Vietsovpetro, a Vietnam-Russia joint venture, accounts for a third of the crude oil extracted in Vietnam. Putin said Russia is committed to providing Vietnam with LPG and other fuels. He also said Russian enterprises are ready to join in modernizing Vietnam’s power plants and help the country build new power plants. The two leaders also agreed to coordinate closely with each other in implementing the Vietnam-Eurasia Economic Union (VN-EAEU) Free Trade Agreement in order to fully exploit its advantages for further cooperation in trade and investment. The FTA, involving Vietnam, Russia, Belarus, Kazakhstan, Armenia and Kyrgyzstan, was signed in May 2015 and took effect on October 5 last year. Vietnam and Russia are committed to creating favourable conditions for enterprises to step up trading, including signing agreements on food safety management and promoting payment in Vietnamese Dong and the Russian rouble, the leaders said. Joint ventures to assemble and produce cars in Vietnam will soon be set up and cooperation stepped up in energy and infrastructure. The two sides will also consider the possibility for continuing cooperation in the use of nuclear power for peaceful purposes. The two nations have also agreed to tighten coordination in humanitarian field. In 2019, the two countries will celebrate the 25th anniversary of a treaty on basic principles for the bilateral friendship, hence they will designate 2019 as the Year of Vietnam in Russia and vice versa. On the East Sea (South China Sea) dispute, Quang and Putin agreed that any border or territorial dispute should be resolved by peaceful means without resorting to the threat or use of force, in accordance with international law, first of all the United Nations Convention on the Law of the Sea 1982 (UNCLOS). They agreed the Declaration of Conduct in the East Sea (DOC) should be implemented fully and effectively, and hoped that a Code of Conduct (COC) will soon be completed. During their talks, President Putin affirmed that Vietnam will always be a priority partner for Russia in the Asia-Pacific region. He said he believes that Quang’s visit will provide fresh impetus to the development of the bilateral ties in the coming time. President Quang reiterated that Vietnam has consistently prioritised strengthening of the comprehensive strategic partnership with Russia in order to promote further bilateral cooperation in all fields. The same day, the two leaders witnessed the signing ceremonies for several cooperation projects including the building a nuclear technology and science centre in Vietnam between the Vietnamese Ministry of Science and Technology and the Russian Rosatom Group, a cooperation agreement on anti-money laundering between the State Bank of Vietnam and the Financial Market Relations Regulation Centre, and another between the Vietnam News Agency and the Sputnik.